As one of the largest processors and traders of palm oil in the world, we have placed sustainability strategically at the core of our business. Our approach to sustainability includes risk-based assessments for supply chain profiling, stakeholder engagement for palm oil traceability and policy compliance and support for suppliers through capacity building and recommendations on sustainable good practices. Supply chain traceability is a fundamental first step towards producing sustainable palm oil and ensuring the reliability and quality of our raw materials. Traceability lays the groundwork for compliance with our Sustainability Policy by revealing where our supply comes from and helps us identify priority suppliers to engage with for improved agricultural practices. 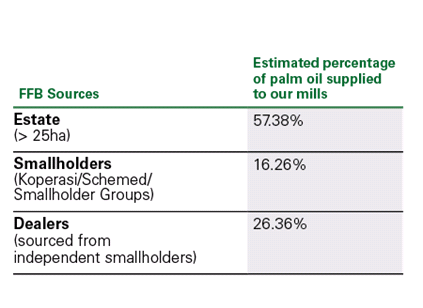 The palm oil industry in Indonesia is complex and involves many stakeholders. There are a huge number of players along the supply chain from the moment the fruit is picked by smallholders to when it reaches us as some supply goes through middlemen. It requires enormous effort to map our supply chain down to its origin; however this is necessary to ensure the level of transparency that is expected by our customers. A reliable and extensive sourcing network upstream enhances our ability to trace the origin of the CPO supplied to our refineries and to monitor sustainable practices. With the commitment of senior management and guided by a comprehensive sustainability framework, we have found that an effective way forward is to involve and engage with key decision makers from diverse groups of stakeholders: plantation owners and smallholders, government authorities, non-governmental organisations (NGOs), civic groups and activists. Our traceability efforts are categorised into two levels: traceability to Crude Palm Oil (CPO) mill and traceability to plantation (Fresh Fruit Bunch suppliers). We have more than 250 independent mills contracted as suppliers, mainly in Sumatra and Kalimantan, Indonesia. In 2015, we began gathering and verifying information about mills supplying to our refineries and achieved 100% traceability to mill in the same year. We have generally maintained full traceability to mill since then. Apical does not own any upstream assets or facilities such as plantations and mills. Instead, we rely on third party supplying mills in Indonesia including those owned by our long-term supplier Asian Agri, to provide us with raw materials such as CPO, CPKO and PK. All our refineries source 100% directly from supplier mills. We have not sourced through any intermediaries and / or refiners throughout our operations up to the present and this practise will continue unless stated otherwise. The total percentage of supply traceable to mill is 99.7% MT as of January 2019. In order to be traceable, suppliers need to provide correct information of their GPS coordinates to show their accurate location, the name of their parent company and mill and a specific address. This information is then further verified by our sustainability consultants known as CORE (which consists of Proforest & Daemeter). We update our Traceability Declaration Document (TDD) every quarter for the facilities above to reflect our changing sourcing patterns and the TDD can be accessed through the supply chain map below. This supply chain map offers access to supply chain information of our refineries in Indonesia that comprise of Apical’s network of refineries, kernel crusher, oleo chemical and biodiesel plants. By selecting the facilities on the map, you can access details of the supply into each. Achieving full traceability to mill has been an important first step in providing us with an indication of the approximate location of their FFB suppliers. This is because plantations need to be in close proximity to the mills for FFBs to be transported within 24 hours. Apical has a target of achieving full traceability to plantation (FFB traceability) by 2020. To reach our goal, we have developed a system with The Forest Trust (TFT) and initiated our Traceability Outreach Programme (TOP), which targets all suppliers especially those in Riau, Jambi, North Sumatra and Kalimantan in Indonesia. In 2017, we partnered with Proforest, Daemeter, Geo Traceability and Yayasan Setara Jambi on two traceability pilot projects in Riau and Jambi provinces. We now use a mobile application developed by our two technical partners to collect data and ease the data collection process. With these efforts, we have been able to trace 77.6% of our FFB sources to plantations as of January 2019. Apical’s suppliers source from either own estates or third party plantations. Out of our total number of third party supplier mills, 21.84% source from their own plantations while 78.16% source from third party plantations. 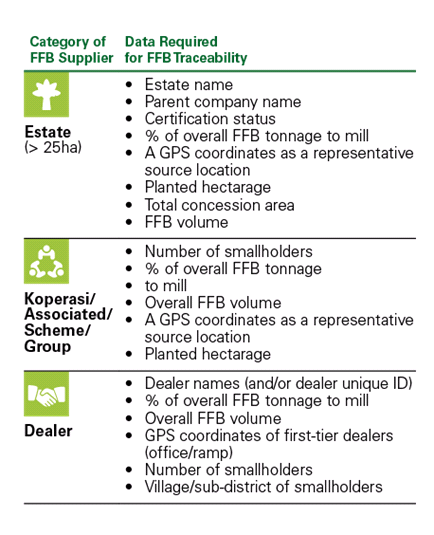 In terms of volume of FFB supplied to Apical, 37.09% MT is sourced from third party supplier mills’ own plantations while 62.91% MT is sourced from third party plantations. These figures are as of January 2019.